Pre-School has now-days taken the place of what grand- parents used to do earlier. With transformation of the society to a nuclear family concept and also the grandparents leading their own lives, pre-school has become a support structure for the parents as well as giving the first exposure to the children to a semi-formal education both having a home and part formal school touch.Hence finding the right Pre-School has become as important as finding a formal school. Broadly these five things should be considered before choosing a preschool for your little one. 2. FACILITIES:The Pre- School should have reasonable play area with outdoor toys like rockers, slides; try cycles, sand pit, swings etc. It is to be ensured that the outdoor toys are preferable plastic toys with rounded sides as iron slides etc. as those seen in public parks may sometime hurt your little ones. 3.HYGIENE, CLEANLINESS & SAFETY: While on a visit to the Pre-School have a look at the washrooms. The wash rooms should be clean and airy with exhaust fans installed. All progressive play schools have installed small toilet seats specially designed for pre-schoolers. These child friendly pots minimize any risk as well as facilitate potty training in small children. Cleaning supplies, paints, brooms and wipers must be stored safely. Electric sockets must be above the level of children while others within reach should be safely covered. 4. 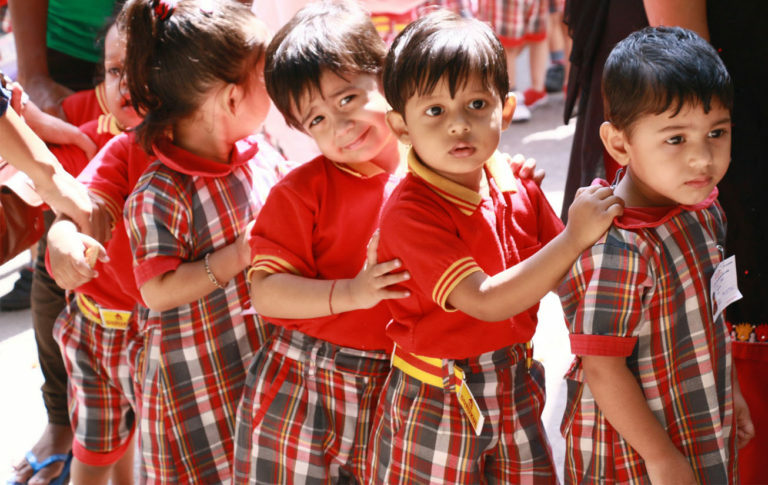 PRE-SCHOOL CURRICULUM: Play schools normally follow play way method / Montessori education and the basic concept of overall development of the child is inculcating confidence as a tool of educating the children. The day to day activity of the child should be a mixture of physical as well as mental stimulation to be achieved by use of beads, blocks and puzzles as well as other creative games.Mixture of Skating, Taekwondo or other outdoor games etc, to develop gross motor skills and music, art and craft should form an integrated part of curriculum.Here help of a small stage for daily confidence building and for overcoming stage fear, kitchen for role play, Colour wheel for colour recognition, Wall of painting, Book-shelves available to children for proper time utilization are some of the tools progressive play school use as teaching aids. The main point to be ascertained is the experience of the Key Resource Person operating the preschool and the staff turnover employed with the preschool. If teachers are since long with the preschool, then it is a sign of congenial atmosphere in the preschool for your little ones also. 5.REFERENCES FROM PARENTS: The reference from parents of Alumni is a good source of information about the play school where you intend to send your little one. You may ask the preschool to give references of parents in your area with contact numbers so as to cross check. Good preschools welcome such initiative from the parents as it builds confidence between the new parents and the preschool as well as help the preschool as the parents of Alumni gives all information about the preschool in detail which serves as a marketing tool for the preschool also.